Week two is now in the bag and there are seven teams who have a perfect record, one team in every division apart from the NFC North. The Eagles had another great turn around, the Seahawks are 1-1, one Manning is 2-0, the other Manning is 0-2, as are the Saints. The prices next to the players come from DraftKings games. 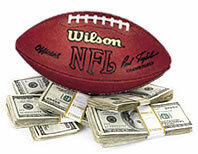 Join me in the NFL Sunday Million for only $27 each and every week. I’ll be playing as Spry13. I’ve cashed 2/2 weeks so far and plan to continue this week. First place is $100,000 and new players are always welcome. This is a battle of two 0-2 teams, but the similarities stop there. The Colts lost narrowly to the Broncos and the Eagles whilst the Jags lost by 17 at Philadelphia after leading by 17 themselves and then got beat up by the Redskins. Andrew Luck is not on fire but performed OK in the two games he played (542 yards, 5 TD’s and 3 INT’s) and he’ll have many opportunities this week against the NFL’s worst team. This pick is as much about the Jaguars as Luck himself. OK, the Seahawks face the Dencer Broncos this week and the Broncos are currently 2-0 and the Super Bowl favorites with the sportsbooks. But weren’t the Broncos favorites going into Super Bowl XLVIII? And have we really seen any strong evidence that anything is different this year? The Broncos have won two home games by a single touchdown and are defensively average, 30th against the pass right now. There are question marks about the Seahawks after their loss at the weekend, but on the road at the Chargers isn’t an easy task for any team. I expect the Seahawks to win this game, and Russell Wilson looks too cheap to me against this defense. I’m picking Lynch this week for much the same reason that I’ve picked Wilson. Lynch himself didn’t play particularly well last week, but in his one home game so far he did rush for 110 yards and 2 touchdowns and there is no reason to suggest that CenturyLink Field won’t be a fortress again this year. Foster has had more carries than any other player in the NFL this season, and has taken full advantage with 241 yards and a touchdown so far in 2014. Foster is a player who ran for 41 touchdowns through 2010-2012 and when fit is impressive. This week they face the struggling Giants in New York and the 2-0 Texans will head there full of confidence. Bernard rushed for 90 yards and a touchdown last weekend and the Bengals host the Titans this week. The Bengals have started off well and they already look like a team bound for the playoffs. The Titans have had a mixed start and are currently 24th against the rush after two games. I’d be surprised if Bernard does any worse than last week and I expect more. I always like the quarterback/wide receiver combination in daily fantasy NFL and having gone for Luck of the Colts, I think pairing him up this week would be a good strategy. In my view both Wayne and Hilton represent value this week, having caught 23 passes between them for a total of 232 yards. Neither has managed a touchdown yet, but that will surely come this week. Picking all three of Luck, Wayne and Hilton is a boom or bust strategy – it could work. Maclin has looked good so far this year with 8 catches for 142 yards and two touchdowns. The Eagles could be the most interesting team to watch this year in the NFL and on recent form, their offense looks great. At home this week against the Redskins they are seven point favorites which should lead to Maclin seeing plenty of the ball. Gates has had a great start to the season with 13 receptions, 177 yards and two touchdowns in the opening two games. The Chargers are on a high after beating the Seahawks, but face the Bills who have had a great start themselves. One downside for the Bills however is that they are 27th against the pass so far in 2014, and this could play into Gates’ hands. I picked the Panthers last week and I have no reason to change my mind this week. The Panthers have given up just 21 points in the two games so far, the 2 nd best total in the league behind the Texans. This week they play the Steelers at home who are coming off a disappointing loss to the Ravens. I wouldn’t be surprised if the Steelers finish with a single digit score. Hope you enjoy the picks and best of luck with your line-ups! I hope to see you at the top of the leaderboards this weekend!